Earlier on this blog I wrote about GIFs, how you should pronounce them and why I love them. Recently, I saw an awesome new way to use a GIF for a PD or how-to website! On the Google Drive Blog, they are making full use of them to illustrate step-by-step point and click directions for new features. Check out this post and scroll down below the video. Here's an example showing how I can edit the HTML in this very blog post. How did I do this? First, I screencasted my clicks with QuickTime (you can also do this with Jing if you're not a Mac user), then used MakeaGIF to turn the video into a GIF. What I like about this vs. embedding a video is that your audience doesn't have to stop reading the text to watch the video, they can skim the entire content of the post easily! I'm definitely going to start using this strategy on more of my training websites! If you've been waiting to upgrade to the new Google Sheets, here's a big reason to take the plunge: Add-ons. These are just what they sound like - add on tools for a Google Sheet or Google Doc. Included in these add-ons are refreshed versions of some scripts we've come to know and love, such as Doctopus, Autocrat and Flubaroo. However, there are many more amazing automations found in the Add-ons docs gallery and Add-ons sheets gallery. You can either browse these by scrolling through or filter by topic - such as education, productivity, etc. Easy Bib: This simply automates and simplifies the creation of bibliographies in MLA, APA or Chicago format. eSign / Panda Sign / hello sign: These three similar add-ons allow you to create digitally signable documents. Track Changes: Is revision history sometimes a bit hard to follow in a collaborative document? I agree! The Track Changes add-on allows you to accept or reject revisions as they come in, just like a certain popular desktop-based word processor. Thesaurus: I am so often opening a new window to find synonyms for words as I write these posts. Having a thesaurus built into the doc will make this so much simpler! gliffy / Mind Meister / WebSequence Diagrams: O.M.G. - love these three add-ons. They take text in your doc and turn it into a visual diagram! Mind Meister is probably the easist to use... give them a whirl! Split Names: Ever import a list of student or staff names then have to alphabetize them by last name... but the names are all in one cell so you need to manually separate them? Not anymore - this add-on does it for you. Twitter Curator: Want to curate your tweets in a spreadsheet? Bam. DriveEye: Ever want to audit your own Drive to see what docs you've got in there and who they are shared to? I have, and have never been able to do it quickly in the past. This solves that problem! 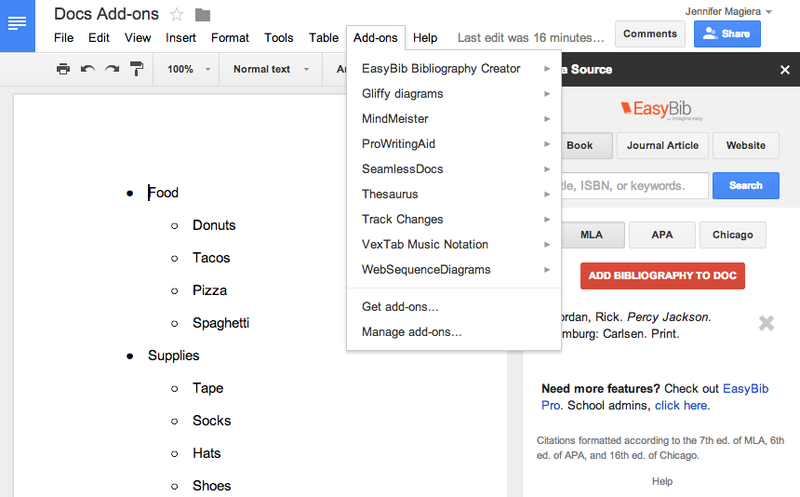 Once installed, these add-ons will forever appear in the add-ons menu of your Docs or Sheets. No need to reinstall or reauthorize. Moreover, most use a handy side-bar navigation, making the workflow and user interface easy and convenient! 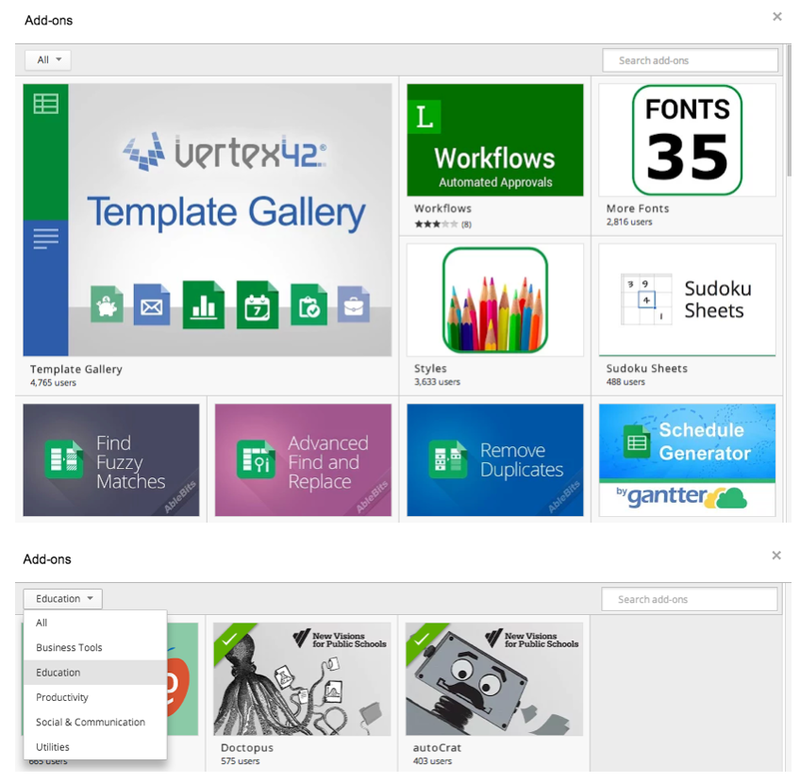 To find out more about add-ons, check out this blog post from the Google Drive blog. Also, if you're a developer or have some savvy coding skills, you can create your own add-ons! Check out this site for more information.